Richard Carlton at www.learningfilemaker.com has released an updated video with content shot at DevCon 2015 in Las Vegas. Here I explain how the new updated SVG gallery tool works. 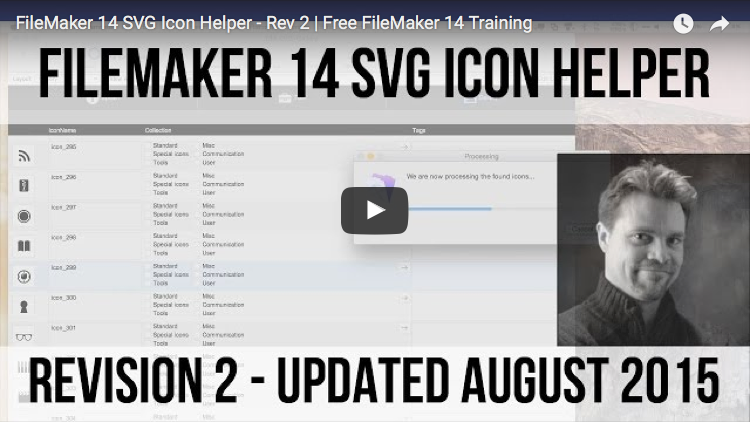 As we explained the SVG format and how it works with FileMaker in the original video, this new updated video includes content from the original, as well as showing how the new tool works. It is very cool and easy to manage your collections of icons and almost magic how FileMaker can get your icons into your solution, without you having to import them separately. Below is my original post about the tool. Here is the updated video we did with Richard Carlton on www.learningfilemaker.com. This video will explain what the SVG format is about and how to use this tool and not least show you a cool tool to organize and work with collections of icons. This is an updated video. If you want to want to get more great content, tips&tricks, be sure to follow @DataManix at twitter, linkedin or facebook for announcements. Thank you very much for sharing this excellent, useful, time-saving resource. It works great! You are welcome – glad you find it useful. Unfortunately, when I try to feed the gallery a folder of SVG icons it crashes FileMaker Pro (16). Any ideas? I can’t tell for sure, but it sounds like you are having plugin conflicts on your system. Please try to move all your plugins, except for BaseElements plugin and see if it works. Also, please note that the version of BaseElements plugin, included in the SVG Gallery is not the newest version. You might want to download the newest version from BaseElements website.